Stila's annual mini Lip Glaze set has arrived. It's a Holiday 2011 collection item, but it doesn't seem particularly wintery or Christmassy or even holiday-themed at all. Apart from the one use of the word 'holiday' on the back of the package, they could probably get away with selling this all year. This year's set contains four best selling permanent shades and four limited edition shades exclusive to the kit. The shades are: Fantasy, Kitten, Believe, Dreamy, Starfruit, Kaleidoscope, Grapefruit and Apricot. Note the caps on Fantasy and Apricot. This is the first time I've ever seen it happen, but those ones leaked in shipping. The packaging is the standard Stila Lip Glaze click pen design, just in a smaller 0.05fl oz / 1.5ml size. 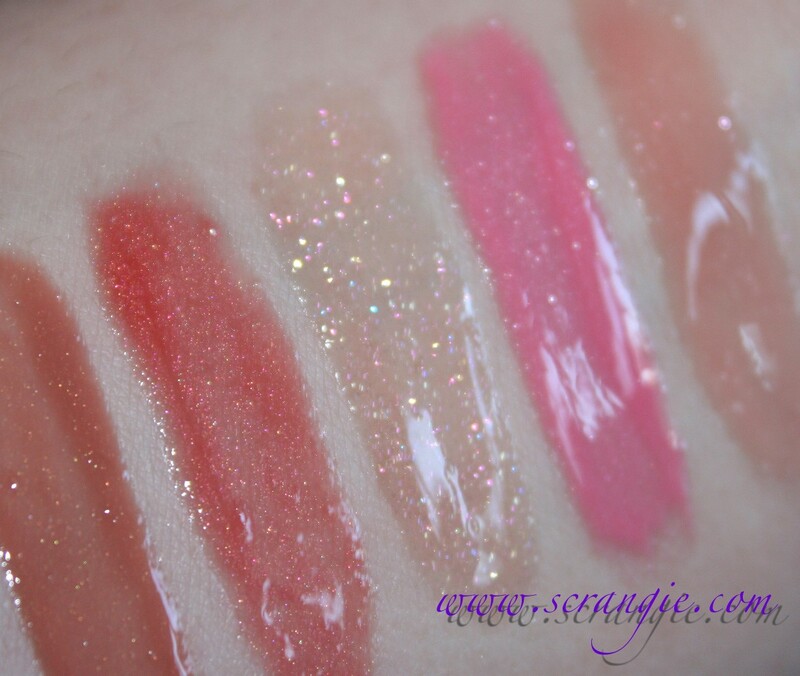 Swatched with flash and without (please click to enlarge): Fantasy, Kitten, Believe, Dreamy, Starfruit, Kaleidoscope, Grapefruit and Apricot. I thought that Kaleidoscope looked extra pretty so I took a bigger picture of it to show you the tiny pastel multicolored sparkle in it. There's blue! 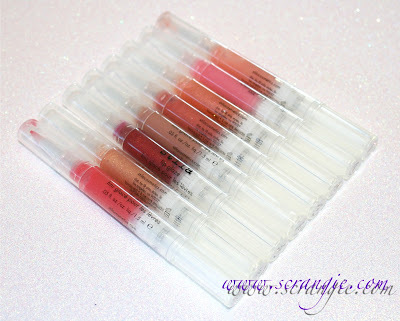 Stila Lip Glaze normally has a sticky formula and these are no exception. They're sticky and actually a little dry feeling, but somehow the formula on these feels different than other Lip Glazes I own. This set is made in China and normally Lip Glaze is made in the USA, so that might explain the different feel of these. They smell a little different, too. 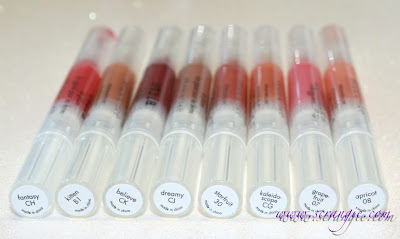 Lip Glaze has a very distinct base scent that you can always smell over the added scents, but it's not present in these. Nice, inexpensive way to try a lot of different colors. Set can be broken up into individual gifts. They didn't put the ugly paper stickers on the tubes this year. The shades are all scented. Kaleidoscope and Believe are very pretty. Packaging is nicer looking this year, not just a plain cardboard box. Formula on these feels slightly uncomfortable on my lips. It's the combination of grit plus sticky with lack of moisture. The shine and color aren't long lasting, but the stickiness stays on your lips long after the shine has worn away. Apricot, Grapefruit and Starfruit seem to be in every Stila set, so lots of duplicates. Some of the tubes leaked during shipping, which is something I've never seen a Lip Glaze do before. The colors in this year's set aren't as interesting as in previous years. Mostly sheer nudes/neutrals with only a little sparkle or color. Overall, a cute little set but nothing too exciting. Lots of repeats of popular shades, so if you collect Lip Glazes or buy Stila frequently, you probably already have four of the eight colors in the set. You could always give them individually as gifts, especially since they didn't put those big ugly stickers on the tubes like they did last year. The four limited edition shades are definitely the standouts in this set. This is limited edition and retails for $25 at Sephora, Ulta or on Stila's website. Thanks for this awesome review, Scrangie! Good eye at spotting those important differences. No wonder they're able to sell this set for just $25. I don't have many Stila lip glosses, and I do like a lot of the colours in this set, but what makes me hesitant to jump on it is that the stickiness lasts even after the shine wears off. :S Now, I don't mind stickiness, but only if there's some shine, too. I used to really like Stila, but I'm done with them. They've become cheap and their products are lacking. All the seem to care about is how many sets and novelties they can put out every other week and how they can make more money by paring down quality and putting out more product. Ugh. Thanks for the review though, it made me realize just how done I am with this brand. Maybe it'll improve, but I doubt it. Jackers, I know exactly what you mean. The cheap made in China giant palettes at Costco, the flimsy, chalky $10 travel palettes, the big ugly flower thing... I also wish they'd go back to quality over quantity. At least those felt tip waterproof liners they've been doing lately are really nice. The liners are nice, huh? So frustrating, it's like I want to like them, they have some gorgeous stuff, but it seems like the focus has totally changed. Good to know that I'm not alone in noticing that. I just feel like if I buy anything from them I'm letting them think that it's cool to put out so many crappy products. Oh well, we shall see. My Apricot lipglaze in the Love & Empower set also leaked in the cap when I received it and it also felt stickier. I was also surprised to see that Stila is making even their famous lipglazes in China now. I don't mind the travel and beach palettes being made there as they are cute and some of the shades are nice. I'll definitely skip this set. All these gift sets are so tempting. Glad you reviewed this.